I've recently discovered a fun idea called Photo Friday - the original idea comes from Delicious Baby, where users are invited to post a travel picture every Friday which links to their blog. I'm inspired to post more frequently on my own travel blog, so I'm adopting the idea....sort of. For my brand of Photo Friday, I've selected a theme. I'm going to dedicate every Friday to posting a photo of a child or children, anywhere in the world, from any of my travels, regardless of where I am or have been most recently. Naturally, the image I post will be for linking on Delicious Baby, but it's also motivational step toward more frequent blogging! And since the source of my inspiration is another traveling mother, well, I figure kids would be an appropriate subject. I just love this picture. The mother saw me hold my camera up, and rather than covering her face or waving me away, she simply moved her eyes another direction, while her son engaged fully with the camera. 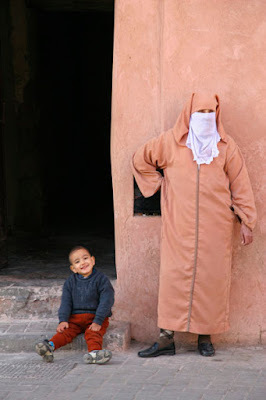 To explore more faces and places of Morocco, please visit the Mira Terra Images Morocco Gallery. And if you're interested in discovering this enchanting country and people, join me on my next journey to Morocco, with TRAVCOA. Enjoy, and happy Photo Friday! That is a great picture. You know, I always wonder what goes through their minds when we take pictures of their everyday life, which is so different for us. I mean, do they think we think of them as oddities or strange or what? I haven't been to this part of the world, however, in central america, predominantly Guatemala the Maya really don't like to be pictured, they feel their soul leaves with the picture taking. I look forward to seeing subsequent photos if you decide to continue posting on photo Friday. As marina noted, in some parts of the world (Guatemala, East Africa too) there are cultures that don't like to be photographed, and that is easy enough to respect. Smile and hold the camera up - if they turn away or cover their faces, don't take the picture. But what I find interesting is that many people in those very cultures are willing to be photographed for some change - in other words, they're ok with selling their soul. In my opinion nothing erodes a culture more quickly. Respect the individual - seek permission, but don't pay for their souls. A smile willingly shared across cultures is far more precious than a soul for sale. And, you're right about participating in Photo Friday. It's a great way to encourage more frequent blogging. I use it for photos that don't really have a long story to go with them, or I'll sometimes use a few photos leftover from a batch I posted with a previous story (sometimes it's too difficult to narrow down the choices, so I just do the extra post).